What is a good crowd control option? Whether the overflow is too much to handle or you just want to get your customers where they need to go, crowd control stanchions are an invaluable asset. 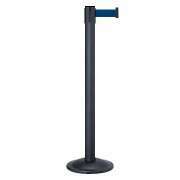 At Hertz Furniture, you&apos;ll find stanchion posts and sign holders for all venues, from opera houses to football games. Contemporary or traditional, chains, belts or ropes - we carry stanchions in a wide variety of styles, options and colors for both indoor and outdoor use. So when the fans come out en masse, come to Hertz Furniture for the best in crowd control barriers. What do I need crowd control stanchions for? Stanchions come in handy on a variety of occasions. If you know that many newcomers are visiting your company or school, you can easily direct them to the appropriate location. Crowd control ropes can also be used to control the flow of foot traffic. When it&apos;s time for the school play, graduation or orchestra performance, creating straight and orderly lines to the ticket booth will be a cinch. What kinds of stanchions are there? Crowd control stanchions are one type of crowd control barrier and they come in a number of different styles. If you want to use them for a concert hall or chapel, you might prefer the more classic style. This option combines shiny sleek metal finishes with rich velour rope to create a vintage opera house charm. Crowd control ropes are available in a selection of deep hues that can be coordinated with any elegant room. The modern stanchion style is versatile and user-friendly. It features retractable belts which are connected to crowd control posts. Retractable belt stanchions can be attached in any direction, which provides maximum flexibility. They retract slowly to prevent injury and are easy to attach for quick arrangement. Belts are available in a huge selection of colors. 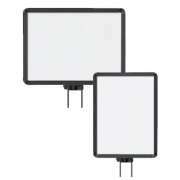 Depending on what you are using them for, you may choose a more subtle hue or a vibrant attention-grabber. What kinds of stanchions are best for more permanent use? If you are constantly setting up stanchions in the same location and configuration, wall-mounted stanchions are an excellent choice. Rather than dragging stanchion posts in and out of storage every time you have an event, you can simply stretch out the belt and be all set up in no time. When the belt is not being used, the small piece will hardly be noticed as it rests subtly on the wall. How do I know how many stanchion posts and ropes to buy? For your convenience, stanchion posts and ropes are available in complete sets. When you order a set, you know that you are getting everything you need to create orderly lines. If you prefer to mix and match or you just want to replace a few pieces, separate crowd control posts and ropes are available as well. What good are stanchions if nobody knows where they are leading to? The best way to ensure that everyone is clear as to where they are going is by labeling stanchions using sign frames. Sign frames can be used to convey important announcements or messages or to provide clear instructions. They can be screwed right on top of stanchion posts or used independently. Hertz Furniture has high-quality crowd control stanchions that will help you direct your customers and visitors in a classy way. Our crowd control ropes and posts are designed for many years of use and benefit If you need help deciding on the optimal model, color or number of stanchion posts, contact the Hertz Design Center for free design and project-planning advice.